A place in the main draw for the European pairing comprising Moldova’s Vladislav Ursu and Slovenia’s Aleksandra Vovk, the no.24 seeds, was a possibility as the final series of fixtures in the Mixed Team event at the Buenos Aires 2018 Youth Olympic Games came to a conclusion on the evening of Saturday 13th October but there was only a slim chance. In order to progress they needed to produce an outstanding performance. They needed to beat the hitherto unbeaten Brazilian partnership of Guilherme Teodoro and Bruna Takahashi, the no.11 seeds. They did just that! Moreover, they recorded a three matches to nil win, a margin of victory that secured first place in the group. At the same time, in the corresponding fixture, Egypt’s Youssef Abdel-Aziz and Marwa Alhodaby, the no.8 seeds, accounted for Malaysia’s Javen Choong and Alice Li Sian Chang by two matches to one; it was the third consecutive defeat for the Malaysian duo, thus fourth place in the group was their lot. However, earlier in the day, Guilherme Teodoro and Bruna Takahashi had recorded a three-nil win in opposition to Youssef Abdel-Aziz and Marwa Alhodaby, who in their opening fixture in the group had secured a two-one victory when facing Vladislav Ursu and Aleksandra Vovk. It meant that three teams were level with five points each, one point being awarded for competing, a further point for a win. In such instances the results between the three teams in question decides the final order, each having beaten each other, match ratio was the determining factor. Vladislav Ursu and Aleksandra Vovk (4:2) finished in first place, ahead of Guilherme Teodoro and Bruna Takahashi (3:3) with Youssef Abdel-Aziz and Marwa Alhodaby in third place (2:4). Therefore, there was no place in the main draw for the eighth seeds, the highest ranked partnership in the group. Drama, as play concluded in the remaining groups, life was less fraught; much more as anticipated. Azerbaijan’s Yu Khinhang and Ning Jing, the 22 seeds, beat the French partnership of Bastien Rembert and Lucie Gauthier, the no.12 seeds. They prevailed by three matches to nil to secure first place ahead of India’s Manav Vikash Thakkar and Archana Girish Kamath, the no.6 seeds. The Indian duo duly secured runners up spot by recording a three-nil win in opposition to the combination formed by Argentina’s Santiago Lorenzo and San Marino’s Chiara Morri, the no.26 seeds. Likewise, similar to Yu Khinhang and Ning Jing, Russia’s Vladimir Sidorenko and Mariia Tailakova, the no.21 seeds, maintained their unbeaten record and thus topped their group. They concluded their first phase fixtures by overcoming Thailand’s Yanapong Panagitgun and Jinnipa Sawettabut, the no.10 seeds by two matches to one; the errant contest being doubles won by the Thai pair (8-11, 11-8, 11-8, 4-11, 11-8). 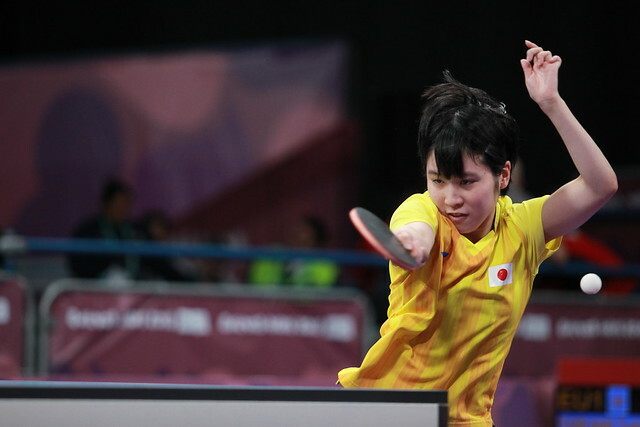 Defeat for Yanapong Panagitgun and Jinnipa Sawettabut meant third place in the group; second position was secured by the Latin American combination of Chile’s Nicolas Burgos and Puerto Rico’s Adriana Diaz, the no.7 seeds. In their concluding contest they registered a three-nil success against the partnership formed by Rohit Pagarani of Belize and Slovakia’s Tatiana Kukulkova, the no.27 seeds. Both round one and the quarter-finals of the Mixed Team event will be played on Sunday 14th October.